If you have any question, just answer! Cannot open file: it does not appear to be a valid archive. if you downloaded this file, try downloading the file again. And I'll correct the mistakes sooner as possible, thanx. i've tried downloading it more than once. mArc, my e-mail address is ok, but sometimes it doesn't notify me the new posts. OK. New upload. Now the game should work perfectly. Hmm...this newly downloaded version seem exactly the same as the original. .... but I am already in my pyjamas. where are the screen shots damnit ? yeaargh! I can't download zips anyway, for some reason they never work on my computer. perhaps someone would like to explain, in very simple laymens terms, as I am next to computer illiterate. Fry - "Fix it! Fix it! Fix it! Fix it! Fix it! ... Fix it! Fix it! Fix it!" Havent looked at it but will soon, I can help you some with the languge if needed. so what is the over all premise, is it going to be 2d like mario or zelda or a nice 3d game like descent and flight sims, first person view or looking at the charater. for side or back or charater.? Sorry, I have been to the beach last week. The game, obviously is frozen, but I'll continue the work in a few days. If you still can't download, ask me for the game in MSN messenger (halfi@msn.com). mArc, can I send you the screenshots by e-mail? hey welcome to PEEL, LordKev! By the way, I have returned to the work today, so in a few days you'll see another beta. And, mArc... Can i send you the screenshots by e-mail?????? And, mArc... Can i send you the screenshots by e-mail?????? if you get it done till tomorrow morning, yupp. Else it will have to wait some as i won't be able to access my email account for a week or so. E-mail sent. I hope it will arrive on time. Mhh... I have thought a subtitle for my game. 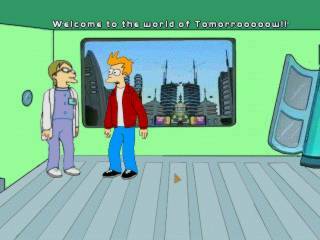 FUTURAMA: "Fear of a future Planet" by Slavon. Do you like it? the game was good, but the colors were a little bad. And, once again, the game doesn't seem to work on any win2k system, I haven't tested it myself (I have win98), but maybe it works in true DOS mode. Have you tried it? the link to the english game given was "http://leela.host.sk/myfiles/uk/futurauk.zip" which resulted in a 404 every time i tried. But there's a "futurauk.ZIP" in the above directory which i'm downloading right now..
if someone else is having problems, maybe this helps.. The futurama staff and all the PEEL people: [-mArc-], Kryten, Futurefreak, Ninaka, Velourfog, Nixorbo, Juliet, Chump, Bart128 and a looooooooongest etc. Thanx for the support, guys!! 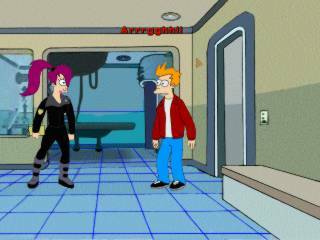 um,downloaded it.when Fry gets off that machine he dissapears.whats up with that? Dammit! I forgot to correct this error in the english version... that's the problem making 2 versions, you have to do it all twice. thats nothing,without a Fry you cant do anything! hehehe, I know, I know, have I to remind you of the game is under constant construction, and all those bugs will be erased? Yeah it's great, Slavon. But is it possible to get out of the Leela-room?